Ritchey has nearly all their aftermarket replacement parts pass through their warehouse in Redwood City, California. 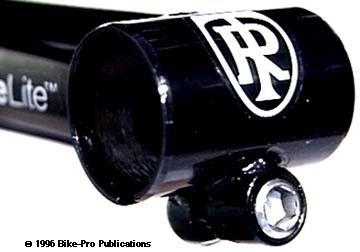 The stems they sell are primarily for bike makers in Taiwan to use as original equipment specified by the marketers of the name on the side of the bike. Very, very few of these stems show up in America for sale to stores for riders. If you elect to order one there could be ridiculously long delivery delays. For high performance road riders Ritchey has brought the principle and materials of their mountain bike stem to the road. It's made in Japan by Nitto to Ritchey's specifications using cro-moly steel tubing. 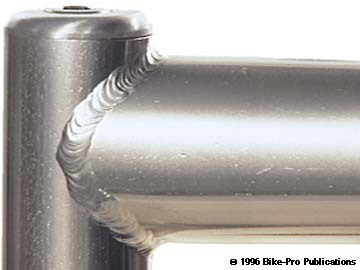 The stem features what Ritchey refers to as "butted" super tubing, which is used in the extension. Remember that Ritchey has made the word "force" generally synonymous with "force directional" where the stress points on a round part are made thicker in the direction where the force exerts itself strongest. On a stem, many would think that to be the quill, but it is the extension which is made Force Directional. The interior of the extension tube is thicker on top and the bottom to strengthen it against fatigue. The quill and the binder tubing are both drilled with sizable holes to relieve heat and stress build up, as the quill, extension, and binder tube are TIG welded together. The binder fittings are made of machined cro-moly rod, bored and tapped for the binder bolt, then welded to the binder tube. After welding to the binder tube, the bottom is then sawn through in one straight cut. The welds are all performed with clean, even pulses. Into the top of the quill section fits a machined aluminum top piece, that finishes the stem and creates the seating for the steel expander bolt. The expander bolt is 6mm in diameter with 1 thread per millimeter, (6mm x 1), and is 130mm long, weighing 30 grams, with a 5mm allen head. The wedge is extruded aluminum with light machine clean-up. The binder bolt is 6mm x 1 and 20mm in length weighing 6 grams. The Ritchey Force Comp Road stem fits 26.0mm diameter handlebars, is made in 90mm, 100mm, 120mm, 130mm, and 140mm in either a 0 degree rise or a -10 degree rise. It will fit handlebars with a 26.0mm diameter. The Force Comp Road in 120mm length with 0¡ rise weighs 260 grams. The Force Comp Road in 120mm length with -10 degree rise weighs 259 grams. Silver only. The Ritchey Force Comp is improved and lighter than the Force Directional. 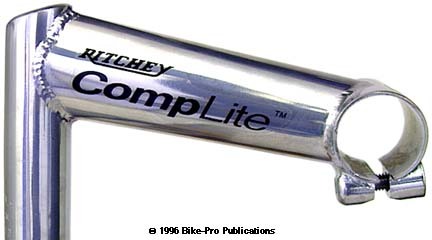 Made in Japan by Nitto to Ritchey's specifications, it is made of heat treated Cro-moly steel. The quill is made of cro-moly tubing, and the Force Directional principle is again employed in the extension tube, making it thicker internally on the top and bottom surfaces to strengthen it against metal fatigue. The quill tubing wall thickness micrometered out to 1.6mm thick with less than .1 mm variation in several measurements. The extension is ovalized at each end providing a broad area of contact for the welds. The binder tubing is 1.6mm thick Cro-moly steel. There are holes drilled through the binder tube and quill, prior to welding to relieve heat and stress. The binder fittings are machined from steel rod that is drilled and tapped for the binder bolt prior to welding it in place. Once the binder fitting has been welded the front of the stem is run through a saw to create the cinch closure system. 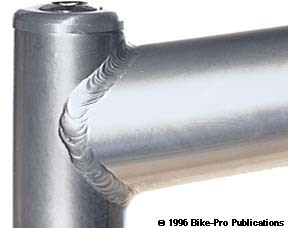 Each of the welds on the stem are performed as clean, pulsed TIG welds. An aluminum cap piece slides into the top of the quill. This closes off the top and provides the cradle for the expander bolt head. 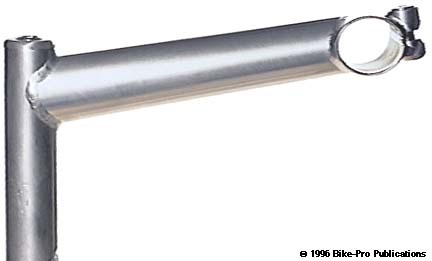 The expander bolt is chromed steel, with 8mm by 1.25mm thread pitch. The bolt has a 6mm hex head, is 130mm long and weighs 45 grams. 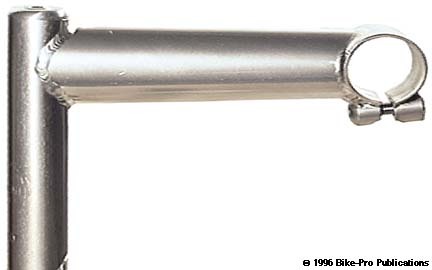 The binder bolt is chromed steel with 6mm by 1mm thread pitch. The binder bolt, with a 5mm allen head, is 20mm long and weighs 6 grams. The wedge is extruded aluminum with some machine work to clean and tap the threads. Notice this stem doesn't have a cable hanger with a brake cable stop. It requires a separate piece which fits under the headset locknut. This piece, can be the Dia-Compe version, the Ritchey "Split Hanger" or the Syncros Hang Doggy. The cable hanger is sold separately, and are listed in the Buyers Guide's Brake section. 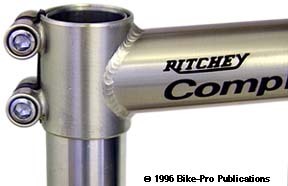 The Ritchey Force Comp stem, has a 25.4mm inner diameter binder tube, comes 120mm, 130mm, 140mm, or 150mm lengths in a 10 degree or a 0 degree rise. It is also made in a 130mm length with a 20¡ rise. All the stem lengths are available in a 1" or a 1 1/8" diameter. A Force Comp Mountain stem in 140mm with a 1" diameter weighs 291 grams. A Force Comp Mountain stem in 140mm with a 1 1/8" diameter weighs 316 grams. The stem is made in a satin Silver color only. Made for Ritchey, by Hsin Lung in Taiwan, the ForceLite is an inexpensive Cro-moly replacement Mountain stem. The quill is made of 1.37mm (.0535") wall thickness Cro-moly tubing, and has a small hole drilled through one side which faces into the extension at time of welding to relieve and stress from the welding process. The top of the quill is closed off by a 16.5mm steel top that is welded in place. This quill top is rear sloping, and drilled to recess and cradle the expander bolt head. The extension tube is ovalized, wider at the binder tube and taller at the quill. The binder is also made of 1.47mm wall thickness tubing. 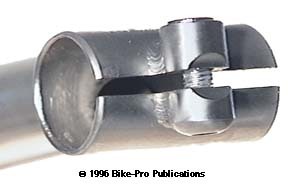 The 1 1/2" wide binder tube, uses a single binder bolt and, like the quill tube, has a hole drilled through one side to relieve heat at time of welding. The binder fitting is machined from steel rod, drilled, tapped for the bolt and run near a grinder to develop the concave shape on the side that will face away from the tube when welded to allow full closure of the cinch. Once the tube and fitting have been TIG welded together the bottom of the binder tube is sawn through to make the cinch mechanism. The steel binder bolt is cadmium plated, having 6mm x 1mm pitched threads that are 20mm long. It has a 6mm hex head fittingand weighs 6 grams. For some reason the expander bolt and its head follow no common expander thread pattern. It is made of chromed steel having 7mm x 1mm pitched threads, a 125mm length and weighs 34.5 grams. The expander bolt head is 11mm in diameter and 7.5mm deep, with a 6mm hex head fitting, and there are no known Titanium replacements for this bolt that wil fit within the steel top of the quill. The wedge is made form extruded, then machined aluminum alloy. The ForceLite is made in two colors, a non-high polished, satin Silver, or a glossy Black, in two diameters, 1" or 1 1/8", all of which fit a 25.4mm outer diameter mountain handlebars. The ForceLite comes in a 10 degree rise in four lengths, 120mm, 130mm, 140mm, or 150mm, also it comes in 20 degree rise in a 130mm length. A ForceLite in a 1" diameter with a 130mm length and 10 degree rise, in Black weighs 279 grams. The CompLite Road is the Road version of the ForceLite Mountain stem. Made in the same factory, using the same techniques, materials, bolts and wedge, it has just changes to accomodate the Road rider. The CompLite comes only in the satin Silver finish, and only in the 1" diameter. Its binder tube has a 26.0mm inner diameter which will fit all standard Road handle bars excepot the Cinelli bars with the 26.4mm outer diameter. The CompLite comes with one of two rises, 0 degree or 10 degree rise, in four sizes, 90mm, 100mm, 110mm, 120mm, 130mm, or 140mm. A CompLite with a 110mm length and minus 10 degree rise, weighs 252 grams. 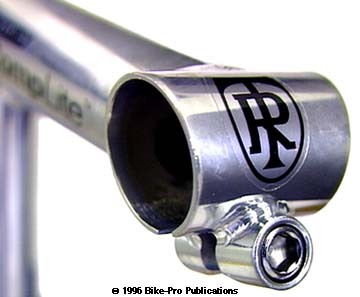 The Ritchey Threadless stem is made for them, in Taiwan by Alico, (who is said also to make bar extensions for Onza and Murray). The vertical clamp tube is made of 1.37mm (.0525") wall thickness tubing. It has a 13mm diameter drilled through the side that faces into the extension tube to relieve heat and stress at time of welding. The extension tube is round, not ovalized, with miter cut ends. The binder tube is made of 1.24mm wall thickness Cro-moly steel. It has a 14mm diamter hole facing into the extension tube to relieve heat at welding. The three tubes are cleanly welded together. The clamp fitting on the vertical clamping tube are amchined from Cro-moly rod. They are turned on a lathe to reduce the center diameter and cut to length rounding the threaded end. Each od them is them drilled and then tapped for the clamping bolt, and finally welded in place. The clamping tube with clamp fittings in place is then sawn through craeting a 5mm kerf between both sides. The kerf is filled with a Black rubber gasket that replicates outline and fills the kerf. The clamp bolts are chromed steel with 6mm x 1mm pitch threads, 17mm long, with a 5 grams weight, and a hex head fitting. A small washer on the bolt absorbs the rotating stress. The binder fitting is un-like any we have seen on a stem binder. It is actually a keyed seatpost binder fitting. The piece is turned on a lathe from rod stock to reduce the center diameter and cut to length, 21.5mm The fitting is drilled through with an 8.5mm hole and then has a smaller 3mm diameter gough milled into the rim of each side. A threaded seat pillar bolt nut with a "key" (protrusion) is inserted from the lower side, a 6mm x 1mm steel bolt, with a 16mm length and a mushroom head is inserted from the top. These last two pieces, the bolt and the nut are really seat pillar bolts used on very inexpensive complete bicycles. 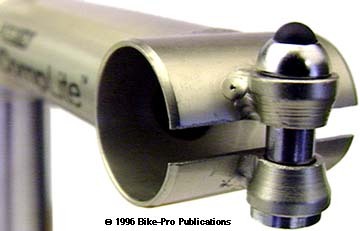 The binder tube has a 25.4mm inner diameter for use with standard mountain handlebars without the need of shims. The Ritchey Threadless has a 10 degree rise, is made in three diameters, 1", or 1 1/8", in four lengths120mm, 130mm, 140mm, or 150mm. There is a choice of a brushed satin Silver finish or a glossy Black. A Threadless in a 1 1/8" diameter with a 120mm length in the Silver finish weighs 177.5 grams.